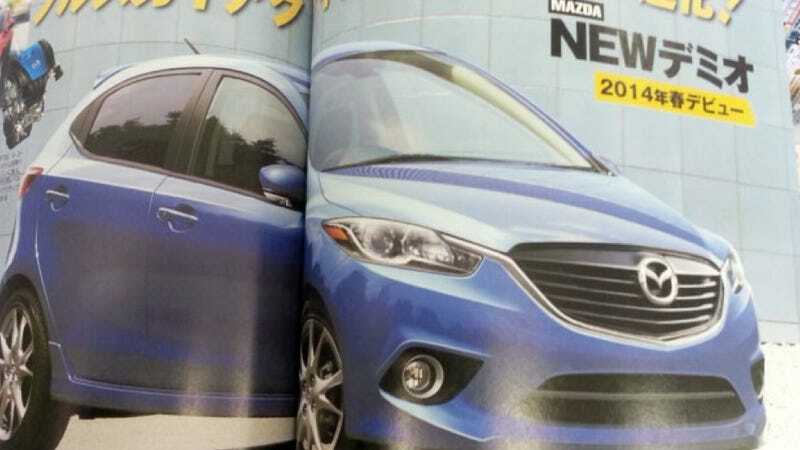 Is This The 2015 Mazda2? Ah, the Mazda2. It's little. It's light. It's tons of fun. Yet it doesn't have Mazda's new face. Thanks to this Japanese magazine scan, we might have just had our first glimpse at the new 2. The new 2 adds Mazda's brand new corporate Kodo design face, as everyone can guess it might. I like it a lot on the 3 and the 6, but the 2 is a bit harder. It doesn't have the long hood or the proportions of its bigger brothers, so the Kodo language transfers, ummm, differently than it does to the larger cars. It doesn't look bad though, it will be one of the more interesting small car designs out there. I also expect that this will go all SkyActiv with possibly a smaller displacement inline-four than the 2.0 in the Mazda3. We'll probably see it in the flesh at next year's New York Show or possibly one of the overseas shows. What say you? Like it? Lump it?